Yesterday I was walking around the house and when I rounded a corner, I heard a rustling noise in the palm fronds I was getting ready to move through. When I looked closely, I saw a gray rat snake staring at me. Not sure if he did the rustling, or perhaps a bird he was stalking. The rat snake was about 4 to 4.5 ft. long. I went ahead and pulled him out of the palm tree, and he was pretty well behaved. Did nip me on the knuckles of my right hand, though while I was carrying him to the building to put him in a bag. Needed to relocate him out into the national forest so he doesn't nab any of the birds we have frequenting around the house. We have several Carolina wrens that roost overnight on the porch, so he may have been heading in that direction. So took him out to the national forest today and sent him on his way. 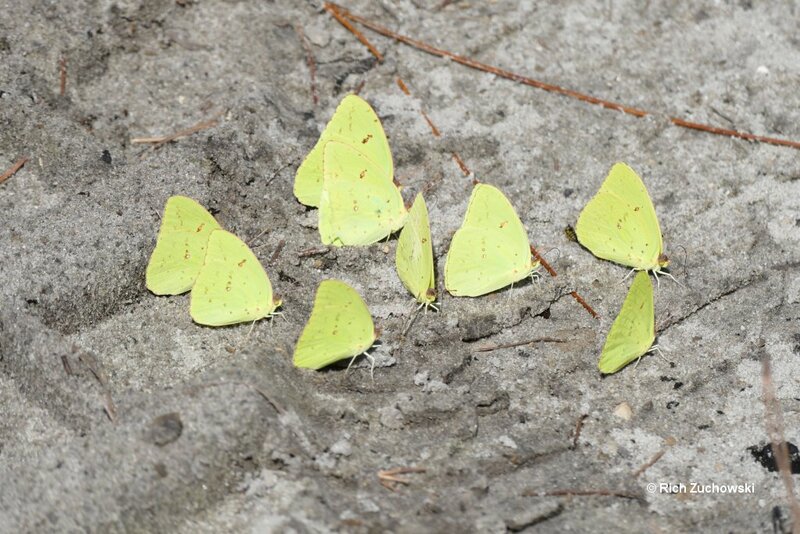 And while we were out there we saw a bevy of butterflies sitting on a damp spot in the middle of the road. Not sure what they were doing there, however, but they seemed worthy of taking a pic of them. Rich you see more snakes not looking than most people do that are looking. Man, I hope not! That would mean there are a whole lot of people out there spending a lot of time looking but not finding snakes. That being said, I think I was actually a really good snake hunter when I lived in Maryland. I could go to the New Jersey Pine Barrens and always find some good stuff. Pine snakes, coastal plains milk snakes, eastern kings, etc. One day I went up there and wound up finding 9 (if I remember correctly) coastal plain milk snakes. Most of them gravid females. 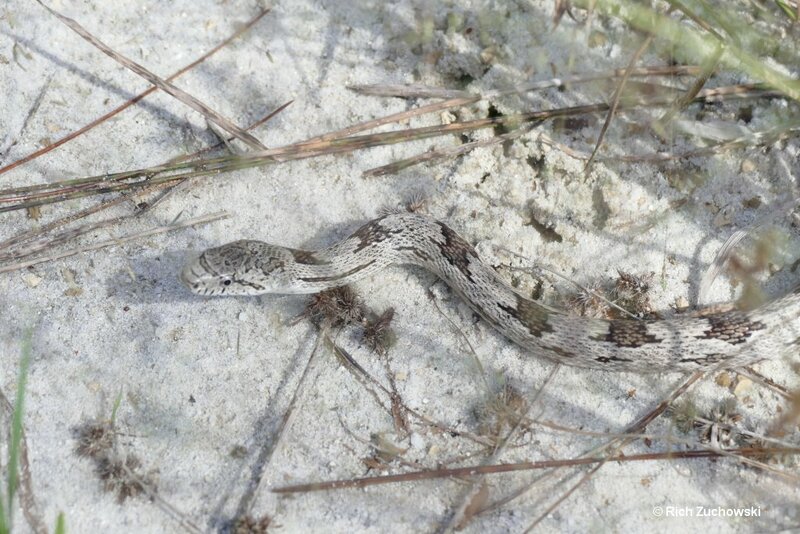 And once someone showed me what to look for, finding pine snake eggs in burrows was very easy to do. If you could get over the apprehension of sticking you hands into holes in the sand where a timber rattlesnake might be lurking, that is. But some times of the year the deer flies, ticks, and chiggers could make for a pretty unpleasant time of it. But all in all I wouldn't mind going back to see the Pine Barrens bogs just chock full of thread sundews again. It was a really interesting place to kick around in. Trips to southern Maryland would always be pretty fruitful, whether it would be coastal plain milks, corn snakes, or eastern kings. And heck, spent some time kicking around on Hatteras and Okracoke looking for sticticeps enough to become convinced that there really wasn't any such animal when you look at the original description of that subspecies by Barbour & Engles. Yeah, caught PLENTY of eastern kings, but nothing like what they described in that locale. But it was fun looking, regardless. Rich I have always wanted to do a trip up to nj and hunt milks. I can go to Louisiana and find Louisiana milks in numbers that makes most people shake there heads, the same with speckled kings. Were as the locals will tell you they are rare but its all in the details once you find your first you know what to look for. I would think its the same with the coastal milks and pines next year I am going to make that trip and stop in Tallahassee to spend the day at Wakulla Springs and if y'all want to meet up and have lunch with the wife and I. Sure. Haven't been out to the Springs for a while, even though it is only 7 miles from my doorstep. Man if I lived that close, we would be there every weekend. My wife and daughter absolutely love it there, my wife grew up going there for family reunions. We love the glass bottom boat tours and the river tour. We just love it. And we absolutely love the resort no TV,s just peace and quiet.